Background: Chronic Obstructive Pulmonary Disease (COPD) is one of the major non-communicable diseases associated with increased morbidity and mortality. Even though COPD is a systemic disorder with the predominant involvement of lungs, several co-morbidities have been recognised in COPD. Both cachexia and obesity are common in COPD. This study explored the correlations between anthropometry and lipid parameters in different stages of COPD. Methods: This cross-sectional study conducted in a tertiary care teaching hospital included 120 subjects who satisfied the Global Initiative for Chronic Obstructive Lung Disease (GOLD) criteria for COPD. After thorough clinical examination according to a predesigned study questionnaire all subjects underwent spirometric assessment for determination of the stage of COPD. 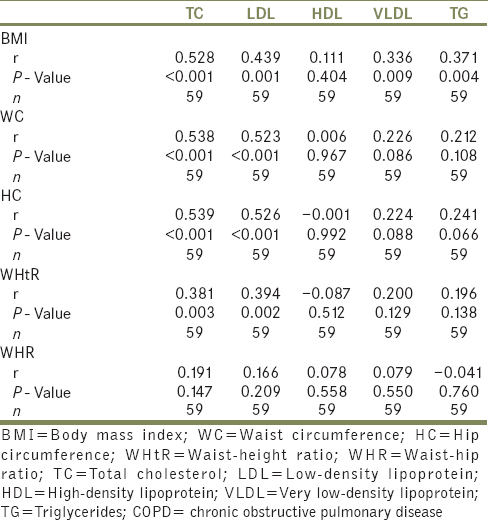 Anthropometric measures like BMI, waist circumference, hip circumference and lipid parameters were measured in all study subjects. 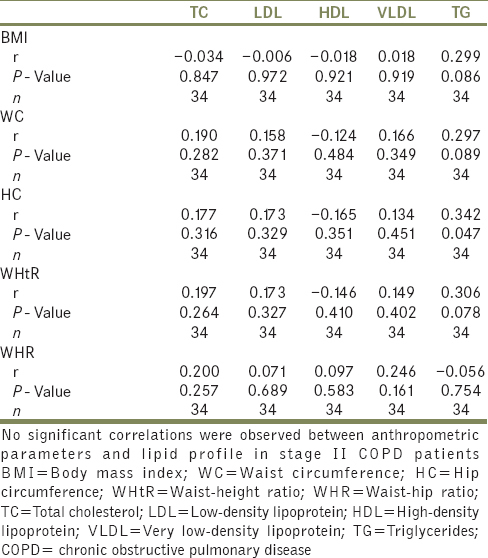 Pearson's correlation coefficients were calculated to see the correlation between anthropometry and lipid profile. Results: Dyslipidaemia was seen in all stages of COPD even though the pattern of dyslipidaemia varied from stage to stage. Significant positive correlations were observed between anthropometry and lipid parameters in stages III and IV COPD. Conclusions: The observations made in this study reveal that anthropometry correlates with dyslipidaemia in late stages of COPD. Chronic obstructive pulmonary disease (COPD) is one of the major non-communicable diseases (NCDs) associated with increased morbidity and mortality. Even though tobacco smoking is the most common known and established risk factor for COPD, epidemiological transition associated with rapid urbanisation, industrialisation and increased vehicular traffic in the past few decades have further aggravated this problem. Indoor smoke from solid-fuel combustion in rural areas is also a contributory factor for COPD. Global burden of disease study has projected COPD as the third leading cause of death worldwide by the year 2020. In India, the burden of COPD has increased >2 fold in the past 40 years from 6.45 million cases in 1971 to 14.84 million cases in 2011 and the number of deaths from COPD exceed half million cases., According to the Global Initiative for Chronic Obstructive Lung Disease (GOLD), COPD has been defined as a disease state characterised by airflow limitation that is not fully reversible. The airflow limitation is usually both progressive and associated with an abnormal inflammatory response of the lungs to noxious particles or gases. Airflow limitation in COPD is defined as a post-bronchodilator forced expiratory volume in 1 s (FEV1) <80% of the predicted value and FEV1 to forced vital capacity ratio <0.70. Anthropometric parameters are commonly used inexpensive research tools to assess the NCD risk factors in the communities. Over a period of time, these anthropometric measures have evolved into reliable indicators for predicting the incidence of various NCD risk factors in all populations though the threshold cut-off values vary from population to population and disease to disease. 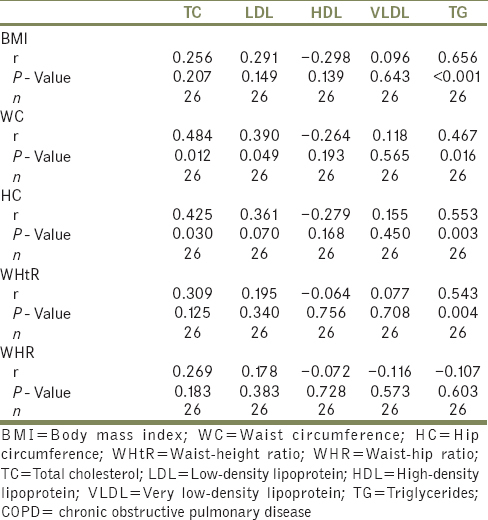 Various studies have shown that anthropometric parameters such as BMI, waist circumference (WC), hip circumference (HC), waist-hip ratio (WHR) and waist-height ratio (WHtR) are useful in predicting the incidence of NCD risk factors such as dyslipidaemia, hypertension, insulin resistance, diabetes and metabolic syndrome in communities. As COPD shares many of the common NCD risk factors and as both cachexia and obesity are common in different stages of COPD, this study examined the prevalence of dyslipidaemia in various stages of COPD and correlated it with anthropometry. The objectives of the present study were as follows: (i) to examine the prevalence of dyslipidaemia in various stages of COPD; and (ii) to study the correlation between anthropometry and lipid parameters in various stages of COPD. This cross-sectional observation study conducted at a tertiary care teaching hospital included 120 participants who satisfied the GOLD criteria for COPD. Written informed consent and the Institutional Ethics Review Committee Approval were obtained before conducting the study. All participants >30 years age who satisfied the GOLD criteria for COPD were included in this study. Participants with a history of pulmonary tuberculosis, lung cancer, ischaemic and valvular heart disease and seriously ill participants who were unable to undertake investigations were excluded from the study. After taking detailed clinical history, participants were clinically examined by a physician according to a pre-designed questionnaire. All the study participants were examined using Spirometry for assessing the severity of COPD according to the GOLD criteria. Participants were categorised according to the GOLD staging in to Stage I (post-bronchodilator FEV1≥80%), Stage II (post-bronchodilator FEV1≥50% and <80%), Stage III (post-bronchodilator FEV1≥30% and 50%) and Stage IV COPD (post-bronchodilator FEV1<30%). Chest X-ray was obtained for all the study participants. Weight of the participants was measured to the nearest 0.1 kg in light clothes on standing bare foot using a well-calibrated balance scale. Height of the participants was measured to the nearest 0.5 cm using a wooden scale fixed on the wall while the participant is standing relaxed with bare foot and heels together touching the wall. BMI was calculated as weight in kilograms divided by height in square metres. WC was measured at the smallest horizontal circumference between the lower costal margin and iliac crest after normal expiration, and HC was measured at the point of maximum extension of the buttocks. WHR was calculated as WC divided by HC, both measured to the nearest 0.1 cm using a steel retractable tape. WHtR was calculated as the WC divided by height. WC ≥90 cm for males and ≥80 cm for females, HC ≥90 cm, WHR ≥0.9 and WHtR ≥0.55. Venous blood samples were taken after an overnight fast for fasting blood glucose and lipid profile. Plasma glucose concentration was estimated using the glucose oxidase method. Serum lipids (total cholesterol [TC], triglycerides [TGs], low-density lipoprotein [LDL] cholesterol and high-density lipoprotein [HDL] plasma cholesterol concentrations) were measured. Cholesterol and TG levels were determined in the serum by commercially available kits on a Chem-7 Semi Auto analyser. HDL cholesterol was measured by precipitation method using AutoZyme reagent kit. LDL and very LDL (VLDL) cholesterol were calculated according to the formulae of Friedwald et al. LDL cholesterol = cholesterol – (HDL cholesterol + [0.46 × TGs]). VLDL Cholesterol = TGs/5. Statistical analyses were performed using the SPSS software Trial Version 16.0. Values were presented as mean and standard deviations, and qualitative variables were expressed as percentages. Pearson's correlation coefficients were calculated to explore the relationship between the measured parameters. For all statistical analysis, P < 0.05 was considered as statistically significant. Data of 120 COPD participants were analysed. The mean age of the total study participants was 52.46 ± 14.08 years. Majority of the study participants were male and constituted 87.5% of the study population, whereas females constituted only 17.5%. Smoking was present in 106 (88.33%) participants, hypertension in 68 (56.66%) and diabetes in 32 (26.66%). Participants were divided into four groups depending on the stage of the COPD. There were only three participants in Stage I COPD, 59 participants in Stage II COPD, 34 participants in Stage III COPD and 24 participants in Stage IV COPD. As there were only three participants in Stage I disease, participants in Stage II-IV COPD were compared for the pattern of dyslipidaemia. Dyslipidaemia was seen in all stages of COPD [Table 1]. In Stage II disease, high levels of LDL cholesterol (66.1%) were the common lipid abnormality followed by TC (47.45%), TGs (45.76%), low levels of HDL cholesterol (38.98%) and VLDL cholesterol (11.86%) [Table 2]. In Stage III disease, abnormal TG levels (61.76%) were the common lipid abnormality followed by the low levels of HDL cholesterol (58.82%), LDL cholesterol (55.88%), TC (41.17%) and VLDL cholesterol (14.7%) [Table 3]. In Stage IV disease, low levels of HDL cholesterol (87.5%) were the common lipid abnormality followed by TG (70.83%), LDL cholesterol (66.66%), TC (41.66%) and VLDL cholesterol (8.33%). When Pearson's correlation coefficients were calculated to see the correlations between anthropometry and lipid profile in different stages of COPD, no correlations were observed in Stage II disease. In Stage III disease, significant positive correlations were observed between BMI and TC (r = 0.528), LDL (r = 0.439), VLDL (r = 0.336), and TG (r = 0.371). Positive correlations were also observed between WC and TC (r = 0.538) and LDL (r = 0.523), HC and TC (r = 0.539) and LDL (r = 0.526) and WHtR and TC (r = 0.381) and LDL (r = 0.394) in Stage III COPD patients. In Stage IV disease, positive correlations were observed between WC and TC (r = 0.484), LDL (r = 0.390) and TG (r = 0.467). Positive correlations were also observed between HC and TC (r = 0.425) and TG (r = 0.553), BMI and TG (r = 0.656) and WHtR and TG (r = 0.467) [Table 4]. The prevalence of current smoking in the study group was 36% in a study compared to the present study where the prevalence of current smoking was 88% and this may explain the higher prevalence of dyslipidaemia in the present study. In a study significantly higher levels of TC, LDL cholesterol, TG and lower levels of HDL cholesterol were observed in hospitalised patient with COPD. In a study, dyslipidaemia worsened with the severity of COPD as shown in this study and was a risk factor for ischaemic heart disease. In another study in COPD participants, the relative attributable risk to dyslipidaemia was 2.2 for acute myocardial infarction, 2 for coronary artery disease and 1.5 for stroke. In Koreans, even though dyslipidaemia was less common in COPD participants compared to general population severe and very severe cases of COPD was associated with dyslipidaemia. In a study lipid subfractions were differentially associated with lung function. Another study revealed that lipoproteins might play modulatory role in lung function in COPD. The exact impact of lipoproteins on lung function in different stages of COPD and the relative contribution of dyslipidaemia to increased CVD risk in COPD is yet to be elucidated. BMI correlated with most of the lipid abnormalities in Stage III COPD (TC, LDL cholesterol and TGs) and WC and HC with (TC and LDL cholesterol) in Stage IV disease. No correlations were observed between HDL cholesterol levels and anthropometric parameters even though low HDL cholesterol was the common lipid abnormality in Stages III and IV COPD. Similarly, no correlations were observed between anthropometry and lipid parameters in Stage II COPD. The limitations of this study are small sample size and availability of limited number of similar studies in this region to compare the observations made in this study. The observations made in this study cannot be extrapolated to other studies conducted elsewhere as ethnicity, body composition, dietary habits and behavioural factors such as smoking and exercise influence lipid profile. Future studies with larger sample size and uniform study design will help in identifying the role of lipoproteins in COPD. Dyslipidaemia is common in COPD and the pattern of lipid abnormalities vary with the stage of the disease. The common lipid abnormalities in COPD in this study were low levels of HDL cholesterol and high levels of TGs, TC and LDL cholesterol. VLDL cholesterol levels were low inspite of majority of participants being smokers. In this study, anthropometry correlated with dyslipidaemia in late stages of COPD. The exact role of lipoproteins on lung metabolism and function in various stages of COPD is yet to be explored. Anthropometric parameters such as BMI, WC, HC and WHtR are useful inexpensive research tools for identifying dyslipidaemia in late stages of COPD. Salvi S, Agrawal A. India needs a national COPD prevention and control programme. J Assoc Physicians India 2012;60 Suppl:5-7. Vijayan VK. Chronic obstructive pulmonary disease. Indian J Med Res 2013;137:251-69. Jindal SK. Emergence of chronic obstructive pulmonary disease as an epidemic in India. Indian J Med Res 2006;124:619-30. Jindal SK. COPD: The unrecognized epidemic in India. J Assoc Physicians India 2012;60 Suppl:14-6. Vestbo J, Hurd SS, Agustí AG, Jones PW, Vogelmeier C, Anzueto A, et al. Global strategy for the diagnosis, management, and prevention of chronic obstructive pulmonary disease: GOLD executive summary. Am J Respir Crit Care Med 2013;187:347-65. Chatila WM, Thomashow BM, Minai OA, Criner GJ, Make BJ. Comorbidities in chronic obstructive pulmonary disease. Proc Am Thorac Soc 2008;5:549-55.
de Lucas-Ramos P, Izquierdo-Alonso JL, Rodriguez-Gonzalez Moro JM, Frances JF, Lozano PV, Bellón-Cano JM, et al. Chronic obstructive pulmonary disease as a cardiovascular risk factor. Results of a case-control study (CONSISTE study). Int J Chron Obstruct Pulmon Dis 2012;7:679-86. Cao C, Wang R, Wang J, Bunjhoo H, Xu Y, Xiong W, et al. Body mass index and mortality in chronic obstructive pulmonary disease: A meta-analysis. PLoS One 2012;7:e43892. Altinoz H, Adiguzel N, Salturk C, Gungor G, Mocin O, Berk Takir H, et al. Obesity might be a good prognosis factor for COPD patients using domiciliary noninvasive mechanical ventilation. Int J Chron Obstruct Pulmon Dis 2016;11:1895-901. Seidell JC, Kahn HS, Williamson DF, Lissner L, Valdez R. Report from a centers for disease control and prevention workshop on use of adult anthropometry for public health and primary health care. Am J Clin Nutr 2001;73:123-6. Niranjan MR, Dadapeer K, Rashmi K. Lipoprotein profile in patients with chronic obstructive pulmonary disease in a tertiary care hospital in South India. J Clin Diagn Res 2011;5:990-3. Zafirova-Ivanovska B, Stojkovikj J, Dokikj D, Anastasova S, Debresliovska A, Zejnel S, et al. The level of cholesterol in COPD patients with severe and very severe stage of the disease. Open Access Maced J Med Sci 2016;4:277-82. García-Olmos L, Alberquilla A, Ayala V, García-Sagredo P, Morales L, Carmona M, et al. Comorbidity in patients with chronic obstructive pulmonary disease in family practice: A cross sectional study. BMC Fam Pract 2013;14:11. Sin DD, Man SF. Why are patients with chronic obstructive pulmonary disease at increased risk of cardiovascular diseases? The potential role of systemic inflammation in chronic obstructive pulmonary disease. Circulation 2003;107:1514-9. Ford ES, Wheaton AG, Mannino DM, Presley-Cantrell L, Li C, Croft JB, et al. Elevated cardiovascular risk among adults with obstructive and restrictive airway functioning in the united states: A cross-sectional study of the National Health and Nutrition Examination Survey from 2007-2010. Respir Res 2012;13:115. Begum K, Begum MK, Sarker ZH, Dewan MR, Siddique MJ. Lipid profile status of chronic obstructive pulmonary disease in hospitalized patients. Bangladesh J Med Biochem 2010;3:42-5. Caram LM, Ferrari R, Naves CR, Coelho LS, Vale SA, Tanni SE, et al. Risk factors for cardiovascular disease in patients with COPD: Mild-to-moderate COPD versus severe-to-very severe COPD. J Bras Pneumol 2016;42:179-84. Finkelstein J, Cha E, Scharf SM. Chronic obstructive pulmonary disease as an independent risk factor for cardiovascular morbidity. Int J Chron Obstruct Pulmon Dis 2009;4:337-49. Joo H, Park J, Lee SD, Oh YM. Comorbidities of chronic obstructive pulmonary disease in Koreans: A population-based study. J Korean Med Sci 2012;27:901-6. Cirillo DJ, Agrawal Y, Cassano PA. Lipids and pulmonary function in the third national health and nutrition examination survey. Am J Epidemiol 2002;155:842-8. Xiaoou LI, Wang T, Yang T, Shen Y, Chen L, Xu D, et al. Serum triglycerides and high density lipoprotein in patients as a potential modulator of chronic obstructive pulmonary disease. Am J Respir Crit Care Med 2013;187:A2896.